Grandma Mary recently posted a video and blog post about what to do if you ever found yourself getting hacked on Facebook. If you give access to your Facebook profile to many applications, it could happen to you, too! Sometimes, all it takes is one click! If you find that you (or supposedly you) are posting to your friends’ walls without your knowledge, that means you’ve likely been hacked! Don’t panic! Grandma Mary shows you what to do! Click here to read her blog post that includes an instructional video. A true couch potato uses their computer’s mouse on the sofa itself or in bed… but sometimes they don’t work too well on surfaces that aren’t smooth like a desk or table. Logitech may have an answer for you, though! 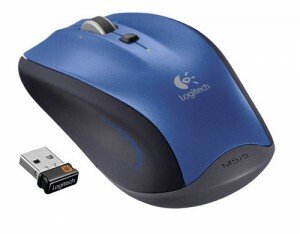 Check out this review of Logitech’s new Couch Mouse M515. Written by Charlie White, the review was posted today to Mashable.com. Getting your company profiled in a positive light on Mashable.com is like winning an Academy Award. If businesses could win Oscars, getting a good story about you written on Mashable would be the trophy. I’m sure the good folks over at Lymbix, based here in Moncton, were thrilled to see coverage of their company posted on Jan. 20 in an article entitled “How a Sentiment Analysis Startup Profits by Checking Emotion in E-mail.” Lymbix has developed a system that checks the tone of corporate e-mails – kind of like spellcheck, but related to tone instead of spelling. After all, choosing the wrong words could turn off your customers… or for politicians, your voters! To read the article online, go to www.mashable.com and enter “Lymbix” in the search box. I was also pleased to see the company responding quickly to critical comments rather than just leaving them unanswered. It proves someone is actually doing their job at keeping track of what is being said about Lymbix online! The latest Facebook scam that has taken hold is spreading like wildfire. I’d say that a good 25 per cent of my Facebook friends have been taken in by the application that purports to tell you how many profile views you’ve had. These numbers are not accurate. Many people report getting the exact same numbers as their friends. Why? Because the applications are only fronts to get your personal information! When you sign up for the application, you must agree to share all the personal information you have on Facebook. Facebook, meanwhile, is urging users not to be taken in by these applications. Facebook users will have surely seen the application that supposedly goes back and searches for your first status update, adding an update to your page something like, “My First Status Update Was: Helllooooo…” or something similar. Again, stay away from these things. According to a Jan. 25 item written by Douglas A. MacIntyre posted to 24/7 Wall St. (www.247wallst.com), there are some potentially worrisome numbers for Twitter. “The average total amount of time people spent on Twitter rose to 2 hours and 12 minutes in November 2010 from 1 hour and 51 minutes in the same month last year. “The most important statistic among these is that fewer people visit Twitter now than they did a year ago. The fact that those who do visit do so more often may be useful to advertisers who want repeat exposure. But, the draw of Twitter to any marketer is that its overall growth is fantastic the way that it is for Facebook or Groupon. Twitter has started to move rapidly in the wrong direction if monthly visits and visit duration are down. I’m not so sure that Twitter will fade into the sunset. It’s become an excellent way to get quick updates and market links and information to targeted groups of people. I think many Facebook users, for example, may have signed up for Twitter accounts to try it out but eventually decided it’s just not for them. Many of the current accounts may be dead accounts, but I think the core group of users is strong, proven by the longer amount of time users spend on Twitter when they sign in. I think it’s just a consolidation of users. Twitter isn’t Facebook. A lot of people window shopped and may have decided it’s not their cup of tea, but the immediacy of Twitter’s data, the vast amount of information that can be gathered just by watching trending topics, and the speed and simplicity of the service should keep it on solid ground. While visits may be down, those who are showing up on a regular basis are increasing their use. This is certainly a silver lining in what some would consider to be bad news. Time will only tell whether New York City’s investment in social media will pay off. If it does, you can expect other municipalities to follow suit, especially the larger ones which compete with the Big Apple for conventions, major events and tourism. I noticed many Facebook friends accepting a friend request from “Armchair Politician” recently. Just be careful when friending anonymous users. Better to be safe than sorry. Is HootSuite Pro a smart investment? “Have you been wondering what’s so great about HootSuite’s new freemium model? Are you wondering if it’s worth the investment? Are you upset about having to pay for something that used to be free? Click here to read the rest of the article and decide for yourself whether or not paying for the premium HootSuite service is worth it to you. Getting your company profiled on Mashable.com is like winning an Oscar. The exposure is huge. Moncton’s own Lymbix was profiled on Mashable a few days ago on January 20 — a big day for the company and the people who’ve worked so hard to get it where it is today. “Whether intended or not, our text-based communication often carries emotional undertones that can often undermine (or give away) our true intentions. Nowhere is this more apparent than in e-mail, which most of us use as our primary means of digital communication and can, on occasion, get us in trouble if we choose the wrong words. Congrats to everyone at Lymbix!